The San Pasqual Valley Preservation Alliance is pleased to join with the following groups in opposing Safari Highlands Ranch. Please take a moment to learn more about the activities of the following groups by clicking on their links and visiting their sites. The Endangered Habitats League is a 501(c)(3) non-profit organization dedicated to the protection of the diverse ecosystems of Southern California and to sensitive and sustainable land use for the benefit of all the region's inhabitants. Through participation in community and regional planning processes, and collaboration with other stakeholders, EHL works to develop solutions that serve the needs of all area residents and preserves our native landscapes. The Friends of Hellhole Canyon is an all-volunteer organization that works to protect and steward ecologically critical land in Hellhole Canyon Open Space Preserve in Valley Center. We educate the public on the natural wonders that comprise the Preserve. We support recreation in the canyon by showing visitors how they can enjoy this chaparral treasure. We also work to acquire and conserve ecologically important open space, which enhances and expands the Preserve’s conservation footprint. Collaborating with state and county government, local foundations, and private donors, the Friends have successfully added 310 acres of critically important open space to the now 2,000-acre preserve. Currently we are working to acquire 400 acres to the east of the Preserve to insure perpetual connectivity for wildlife to other open space areas including Rancho Guejito and the San Dieguito River watershed. Click HERE to view the opposition letter submitted by Friends of Hellhole Canyon regarding the Safari Highlands Ranch development effort. The Sierra Club is the nation's largest and most influential grassroots environmental organization with three million members, 14,000 in San Diego and Imperial counties. Successes range from protecting millions of acres of wilderness to helping pass the Clean Air Act, Clean Water Act, and Endangered Species Act. Working under an adopted set of conservation priorities, Sierra Club San Diego’s Conservation Committee keeps vigil over conservation issues & campaigns, and maintains liaisons with government agencies & non-government organizations in San Diego and Imperial counties. Click HERE to view the opposition letter submitted by Sierra Club's San Diego chapter regarding the Safari Highlands Ranch development effort. 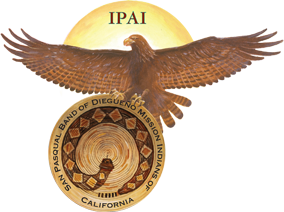 The San Pasqual Band of Mission Indians (SPBMI) has deep ancestral ties to the San Pasqual area. In the late 1800's, the SPBMI were forcibly removed from the San Pasqual Valley area. Nearly 40 years later, a reservation was established in the hills overlooking Lake Wolford. In the 1950's, descendants of the original band began relocating to the reservation. The SPBMI Culture Committee is responsible for preserving the Kumeyaay culture on the San Pasqual Reservation for future generations. It is also responsible for the maintenance of its Culture Center overlooking Lake Wohlford; its museum, resource center and archive of tribal documents and artifacts. The San Pasqual Reservation is now also home to the Valley View Casino – the tribe’s most important economic asset. Click HERE and HERE to view the opposition letter submitted by the San Pasqual Band of Mission Indians regarding the Safari Highlands Ranch development effort. The Buena Vista Audubon Society (BVAS) is a 501(c)(3) non-profit focused on conservation through education, advocacy, land management and monitoring. Their Conservation Mission is to help educate BVAS members and the general public on important conservation issues, to influence public policy and programs in order to better protect the natural environment, and to actively support programs to protect, preserve, restore, and enhance natural ecosystems on a local, regional, national, and international level. California Chaparral Institute is a 501(c)(3) nonprofit research and educational organization dedicated to the preservation and protection of native shrubland ecosystems, especially chaparral. Chaparral offers vital natural resource values that help maintain California's ecological health, such as providing watersheds to protect our water supplies, carbon sequestration to combat climate change, and habitat that supports some of the highest levels of biodiversity on earth. Chaparral remains one of the last bastions of the California condor. The Environmental Center of San Diego is dedicated to the preservation and protection of the natural environment throughout San Diego, through education, advocacy and direct action, including owning and operating accessways on behalf of the public to maximize public access to and along the coast consistent with sound resource conservation principles. Escondido Chamber of Citizens is an organization of residents, community and business leaders formed in 1997 to focus on gathering and disseminating information on a variety of local public issues and concerns, as well as working with local, county and state officials in pursuit of the best possible quality of life. ECOC was the catalyst for, and the movement behind, Proposition S, "The Growth Management and Neighborhood Protection Act" passed by majority vote in 1998. Prop. S was pivotal in closing a loophole that allowed an Escondido City Council majority (3 votes) to approve amendments to the City's General Plan regarding residential development density. Prop. S helped control some of the rampant residential growth slated for Escondido by putting control in the hands of Escondido voters when developers seek an amendment to Escondido's General Plan. Although SHR violates the Smart Growth principles detailed in Escondido’s current General Plan, doing so does not require an amendment to Escondido's General Plan. Nevertheless, ECOC remains a powerful and passionate group of residents and leaders focused on land use and quality of life issues throughout Escondido and surrounding areas. Click to HERE view the opposition letter submitted by the Escondido Chamber of Citizens regarding the Safari Highlands Ranch development effort. Save Our Countryside is a group organized to challenge the proposed Lilac Hills Ranch development north of Escondido and growing efforts to develop the backcountry of San Diego County. - Measure B defeated! Escondido Neighbors United is an alliance of engaged residents working for the benefit of the rural, urban, and natural communities in the Escondido Area. Their goal is to advance protection of communities, protect natural resources, ensure sustainable planning and development, prevent and secure cleanup of contamination, and support of environmental justice in the Escondido area. Major areas of interest are the Felecita Creek area and contamination from the Chatham Barrel Yard site. Show your support by following us on social media. Click here to be linked to our secure PayPal donations page. 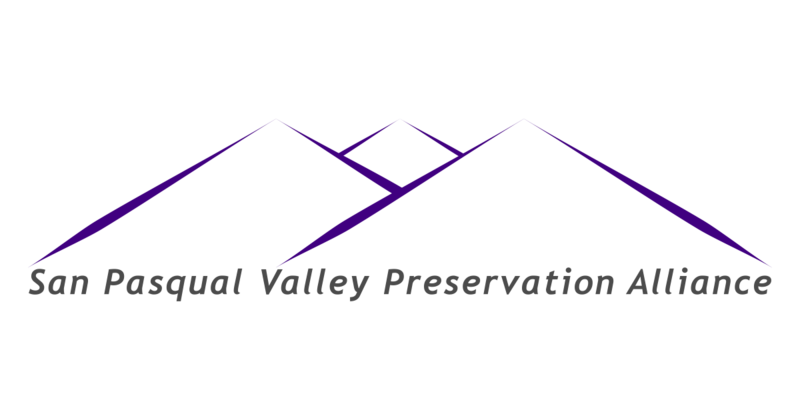 The San Pasqual Valley Preservation Alliance is a 501(c)(3) nonprofit organization. Your donation is TAX-DEDUCTIBLE as permitted by law. Click HERE to view SPVPA's Letter of Determination from the IRS. We are also in California's State Registry of Charitable Trusts (Registry Number: CT0233310).